The big reveal is complete, and here’s the new photo of Heath Ledger as The Joker, from next summer’s Batman Begins sequel, The Dark Knight, on the cover of the new issue of Empire. How awesome and creepy and disturbing is that? I do wish that Empire hadn’t inserted their logo behind his head, because they’ve unintentionally made the entire top of the picture look a little off. 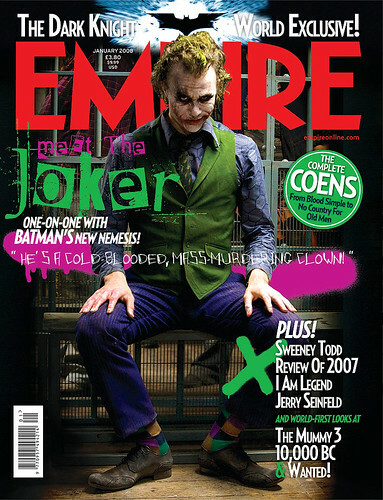 What matters is that The Joker looks very, very scary, and I’m still pleasantly surprised that director Christopher Nolan have the guts to go as far as they have with his look. The skin on his face is a mess, and it looks like he’s got chemical burns on his right hand. Scary, wicked and evil. Just like The Joker should be. The Dark Knight opens on July 18, 2008, but we’ll get to see Ledger’s Joker in action in a short film debuting before IMAX prints of Will Smith’s I Am Legend on December 14.